While top three in its class is good, consider for a moment that Hyundai sold 26,685 five-passenger Santa Fe Sports, Ford delivered 16,580 examples of its five-occupant Edge, Nissan pulled in 10,128 Murano customers, and Dodge found another 25,646 buyers for its 5- and 7-passenger Journey. Even Kia, which normally doesn’t sell even close to the levels of any of the above, managed to attract 14,372 Sorento customers. 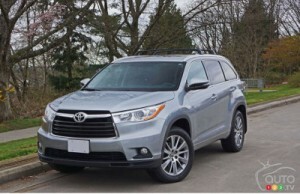 You’d think a light would go on somewhere in the minds of the Toyota collective and, voila, a 5-passenger SUV would appear, but so far we’re left with the very good, 7-passenger Highlander which, unfortunately, doesn’t sell as well. I must admit, though, it’s still my favourite midsize crossover from a styling perspective. It’ll soon get upgraded for the 2017 model year, however, with a bolder, deeper, and edgier version of the current grille, plus modified headlights, taillights, and body panels, not to mention a new, direct-and-port-injected 3.5L V6 and a more efficient 8-speed automatic transmission. It’ll be a significant mid-cycle makeover, but probably not so much that you’ll be sorry if you purchased the current version. Read the full review on the Auto123 website.